Since I purchased Humble Bundle 6 (not available anymore, sorry!) full of Android games, I thought I would see how my Nexus 7 functions as a gaming device. I was pleased to find some real gems; Android is a great platform for indie developers because anyone can develop for it and release games with no fees. While there’s still plenty of ad-heavy, clicky, freemium “games” out there, the games below are all polished gems worth trying. Note: Though I played all these on Android, some are currently only available on Android with Humble Bundle 6. Rachel mentioned this one; I played it long enough to beat it and it is quite fun, especially if you played the original Oregon Trail as a kid. Expect to die your first time or two until you figure out the game. Unlike Oregon Trail, it has several different mini-games and more complex dynamics; you can upgrade your car, or learn combat skills; you can do jobs for money or brave the zombies to scavenge supplies. Available for every platform. Simple, yet addictive rhythm game with hip chillout music. Available for iOS (Android with HB6). Turn-based strategy combat game with fascinating atmosphere and brutal AI. Available for Win, Mac Linux, iOS, Android. A hip, hexagon puzzle game that is both challenging and relaxing. Available for PC, Mac, iOS (Android HB6). A puzzle platformer where you roll a ball across a twilit landscape. It has a beautiful atmosphere and can be quite challenging (sometimes frustrating?). Available for Windows on Steam (Android with HB 6). Somehow I missed this adventure game when it originally came out in 1996. Full of mystery, conspiracies, templars, and artifacts, it’s a great point-and-click adventure, with remastered art, sound, new playable character, etc. Great fun for any adventure game fan. Available for iOS, Android, Mac, PC, DS, Wii. Speaking of point-and-click adventures, here’s another fantastic one. It deals with stolen memories, arcane rituals, and lost rites. The plot is well-paced, with delicious twists and poetic imagery. Mature content. Available for Win, Android. Animal Crossing: New Leaf. Explanation of what it is and its appeal. 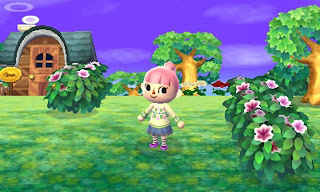 I've given in and I started playing Animal Crossing: New Leaf. I hesitated for a long time because I had tried City Folk for the Wii and found it kind of boring. I guess I feel like if I'm going to go to the trouble of booting up the Wii, I should be able to play something and get a tangible amount of progress done towards winning a game. But for some reason on the 3DS I've stuck with it thus far (I suspect that its trendiness, and the non-demandingness of the 3DS contributed). I'm both impressed and overwhelmed by how this game expects me to play almost every day. If you haven't played any Animal Crossing games, it's kind of like the Harvest Moon franchise, in that you harvest/gather/catch various things and sell them at a profit, except Animal Crossing occurs in real time. So there are certain things that only happen on Sundays, and holiday events for things like Christmas and Halloween. In New Leaf, you are the mayor of a little town, complete with animal neighbors who ask you to give them things and make up catch phrases for them. Aside from the ecological carnage you can inflict (uprooting flowers, catching endangered fish, and chopping down trees being foremost), the game is non-violent. The social features of New Leaf are probably the best I've seen for a 3DS game (okay, they're the only online features I've ever used in a Nintendo game, period). 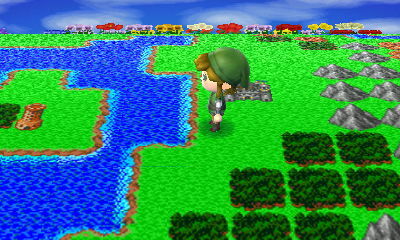 If you so choose, you can open your town up to having visitors from your list of 3DS friends, or you can go visit them. You can visit the villages of non-friends through the dream world, and you can play minigames internationally through the island. Having friends who will let you visit their town is also strategically important, as your home village fruit sells for more in other towns, and if you get into turnips you stand a better chance of not losing all your money if your friend has a spike in turnip prices while yours are declining (it's called the stalk market). I love how the social features aren't vital but make certain aspects of the game easier. The day-to-day play of New Leaf isn't very gripping. You can dig up fossils, talk to your neighbors, buy furniture/clothes, and donate new creatures to the museum. I think the real satisfaction from New Leaf comes from watching your town and collections grow. Of course, all the hours you put in increase your emotional attachment to the game too. It's not just about collecting things though. It's also about how you display your items and how you design your town. PS Check out this horror village, Aika village, that someone made their animal crossing town into (start around 4 minutes in). Remarkable!